A gentleman on twitter posed this question - What heresy is espoused by comparing the mystery of the Trinity with the unusual collision of three incarnations of the Doctor in a particular episode of Doctor Who? For anyone who is not familiar with Doctor Who: you really ought to become familiar with the series, it's fine TV although the latest series may have been wearying to keep up with the plot. However, in much the manner of the condescension of the Son to reveal God (for Jesus is the 'image of the unseen God), I'll take a moment to explain the idea of this episode. The Doctor is the last time-travelling Time Lord from the planet Gallifrey. Historically (in the series, noting that talking of time gets rather confusing with time-travel), there was a time-war between the Time Lords and the great enemy, the Daleks which concluding by the Doctor annihilating the planet to end the war for the greater good. Fine. But this rather confusing episode, shows the (previously unseen) incarnation of the Doctor who made this decision as his wrestles with his (and this weapon of mass destruction's) conscience. He is then allowed to meet two future incarnations of himself converging in 1562 England. And the story concluded eventually by the three Doctors, along the other past Doctors (and their TARDISes) using a backhand tactic to save the Planet Gallifrey from destruction. We have three Doctors, all in one place. Each one is fully the Doctor in his own right. There is only one Time Lord known as Doctor. 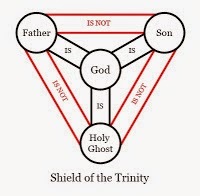 So it looks promising as a comparison to the Trinity, which states the Godhead is one and the three persons are distinct from each other. Modalism - the belief that God appears in three different modes. As if God wore different masks depending on his activity (based on ideas like' the Father and I are one'). This denies the distinctness of the persons. Partialism -Father + Son + Holy Spirit = God. Whilst this is useful to emphasis that God the Father does not exist apart from the Son or Spirit and the unity of God, it falls short as it implies that each person is 1/3 God. Arianism - This was a belief that Jesus is not equal in majesty to God the Father. Similar ideas of subordination are sometimes heard too. Tritheism - Three gods. Simply wrong. Let's consider the Doctor Who scenerio. Firstly, are the three incarnations all the same person or 3 different people? There could be philosophical considerations on personhood to consider, but for the sake of simplicity let's allow that they are 3 distinct people. (The common man would probably not say that David Tennant's Doctor and Matt Smith's are the same person). So the essence of the incarnations is the same substance - the Doctor. And this is expressed as three people. 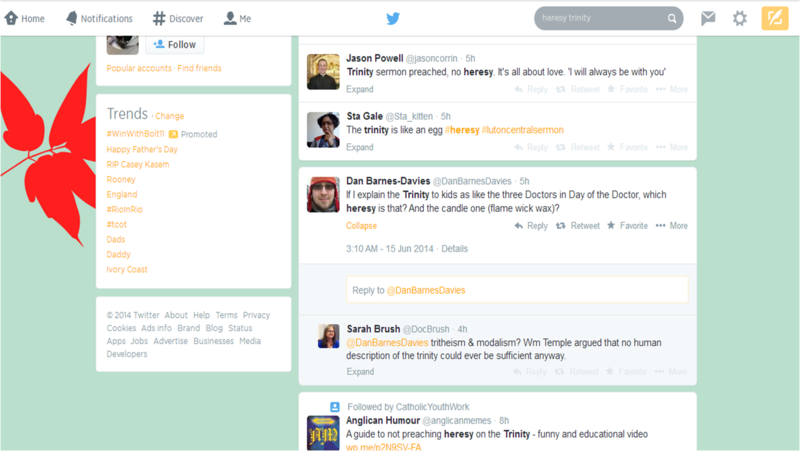 This is the attempt to relate this most similar to the orthodox presentation of the Trinitarian doctrine. There is a hint of modalism - in the sense that (ordinarily) you would not encounter multiple incarnations in the same time/space. One form of modalism would propose the God of the Old Testament showed himself as Father, during our Lord's life God was in the form of the Son and after the Ascension God took the form of the Holy Spirit. In the same way, as one incarnation of the Doctor passes away, and new one comes into being. There is perhaps a Tritheism idea present - three Doctors, all possessing the full faculties of the Doctor's nature and identity, but whom have the ability to act independently of each other. However, the Doctor is a unique individual of the species 'Time Lord', and as such the three incarnations are not separate individuals from the category of Doctor, as a dog would be from animal. Overall, while this idea could prove helpful to see perhaps the distinctness of one being, it might fall short on the unity side of God's nature. As one encounters each of the incarnations of the Doctor one wouldn't necessarily consider them the same being/person, yet we do know Jesus as God through our encounter with him. Indeed, it is the lived reality of Faith whereby the Christian Church found itself with the conundrum of seeing the Divine in both Jesus and Holy Spirit yet know through Divine Revelation (and reason) that there is only one God. Certainly an interesting one. One I'd like to get my teeth into properly when I have more time and understanding. It's a topic I'd not want to argue with, as I don't understand too much of the history and development of the doctrine, or indeed it's complicated implications. However, it is one I'd welcome respectful discussion on for the purpose of building up one another. Unfortunately, it seems rare to find people open to have fruitful discussions on religious matters.